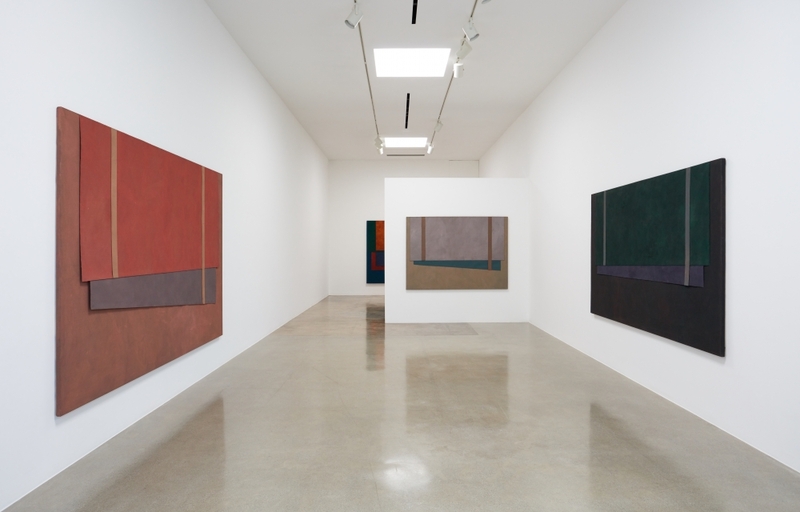 Installation view of "Mary Obering" at Kayne Griffin Corcoran, 2018. In the written component of her 1971 MFA thesis Mary Obering discussed her desire to be an artist of her time. This text reveals an assured, sophisticated, well-read young painter versed in the conversations then current in the art world, with the bulk of her bibliography comprised of critical articles from the previous two years. While resolute in her conviction that she was a painter, she also felt strongly drawn to the ideas and work of object-makers, and the bulk majority of the citations in her thesis were of minimal and postminimal artists, including Donald Judd, Keith Sonnier, and Eva Hesse. This led her to relate her work to a diverse set of artistic problems, not just those specific to painting. Soon after graduating, Obering moved to SoHo, which was then a small, bustling community of painters, sculptors, dancers, musicians, and other participants in the vibrant cultural life of New York City in the 1970s. They were drawn to the cheap rents and large spaces that characterized this formerly industrial neighborhood. Their shared creative calling brought them together, as did a pioneer spirit necessary to convert these former factories for for domestic use. For Obering this tension was the key appeal—, and what she wanted for her own work, which can perhaps be described in similar terms. She noted that, while fabric functioned in her paintings as a compositional element more than as something meant to be independently legible as a certain material, it was the juxtaposition of material and visual registers that was the desired goal. As she writes: “The pieces of fabric etc. which I have attached to my canvases perhaps operate to keep the illusory quality of the stretched canvas in check and to point up the duality in the canvas—the coexistence of implied three dimensionality and two dimensionality.” This evocation of ambiguity is of central importance to Obering, who confides that “ambiguity seems to appeal to me, I like the idea of combining illusionism with flatness, making use of opposing forces.” In this way Obering can be located between the explicitly painterly aspirations of certain artists in the 1970s, such as Brice Marden and Larry Poons, and the more conceptual, material-oriented ones of postminimalists like Sonnier and Saret. She respected both kinds of work, and sought to bring together elements of each in her own paintings. In the paintings illustrated in her thesis, which date from 1969 and 1970, Obering utilizes fabric as both a physical and a compositional component, having it droop and drape within a large, abstract, stained expanse of color. When she arrived in New York she both expanded the presence of pieces of unstretched canvas and more fully subordinated them to a painterly whole. Some of the resulting “drop” paintings were exhibited at Artist’s Space in 1973, selected by none other than Carl Andre, who had become a friend and supporter of Obering’s work after first seeing it in a group show in Denver. In After the Dance, for example, successive layers of canvas are dropped—or “shingled,” as the critic Bruce Boice provocatively described the effect in a review of a 1972 exhibition of Obering’s—from the upper margin of the painting, occupying the majority of the picture plane. They hug close to the surface, not raising its profile much. In her thesis Obering had already identified color relationships as a central concern, and they. It is these, not material ones, that are indeed the primary thing to be perceived and experienced here. Approaching the painting from across the room we are struck by the subtle resonances established between the jewel-like tones of green, pink, and sand with the dominant blue center just above them, as well as with the peach outer border. The sequence of bars that arises from Obering’s systematic stacking of loose canvas underscores the central element, while also anchoring it, visually, to the same plane as the other colors, creating a sense of a vibrating, variegated whole being held together in tension: an example of the spatial ambiguity Obering prized. If tThis fundamentally geometric organization of the painting into a central rectangle and an outer border set off with internal bands, each of which constitutes a vibrant punch of pigment, means that our first, ande primary, experience of the work thus operates along painterly lines dictated by relations of color and form. It is only, later, a secondary materially-inflected one emerges when we get up close to the painting and discern the different overlapping lengths of canvas. A, thatt this point we perceive that theis composition has been in part physically assembled. What at first seemed to be a single, flat plane is revealed to be anything but. This is a provocation to our initial understanding of Obering’s painting as a straight-forward abstraction, without undermining that experience; rather, it complicates and expands it. We realize that the emphatic way in which the color relationships impressed themselves upon us was due to the fact that every color has a separate physicmaterial vehicle, each of which is related to the other by being layered physically, one on top of another, in addition to being juxtaposed visually, side-by-side. No doubt it was this aspect of her work that earned Obering the respect of minimalist friends like Andre and Judd. In After the Dance there is something of both the one thing after another material aggregation of one of Andre’s lines of bricks, say, and the color relationships of, for example, the multiple projecting components of a Judd stack. In Obering’s “drop” paintings, because each piece of colored canvas is layered, one on top of the other, the lowest is the most concealed. In Deja Vu, for example, the largest piece of colored material is the length of unstretched grey canvas closest to the stretched canvas support. But because it is mostly covered by the other sections of canvas it ends up having the least visible square footage. Yet, because of the way in which Obering has physically assembled this work, the grey passage, however little of it is visible, nonetheless carries the full presence of the total canvas piece, since we recognize that we are seeing just part of a larger whole once we become acquainted with the painting’s unique physicality. What at first seemed to be a single, flat plane is revealed to be anything but. No doubt it was this aspect of her work that earned Obering the respect of minimalist friends like Andre and Judd. In After the Dance there is something of both the one thing after another material aggregation of one of Andre’s lines of bricks, say, and the color relationships of, for example, the multiple projecting components of a Judd stack. Obering’s Deja Vu deploys the effects of draping such that they have an even greater influence on the painting’s visual impact. This is because the painting’s two-part composition is comprised of sections of layered canvas, which are related, but vary from part to part. Essentially, there are two differently sized and colored rectangular lengths of canvas. Visually, they are set next to one another, but physically they are layered, one on top of the other, descending from the upper (and outer) most, to the lowest and most concealed. The largest piece of colored material is the length of unstretched grey canvas closest to the stretched canvas support. But because it is mostly covered by the other sections of canvas it ends up having the least visible square footage. Yet, because of the physical way in which Obering has composed this work, the grey passage, however little of it is visible, nonetheless carries the full presence of the total canvas piece, since we recognize that we are seeing just part of a larger whole once we become acquainted with the painting’s unique physicality. At this point we arrive at a second yet another way to reading of the painting, one based on our apprehension of the what the layering of pieces of canvas and, by extension, what causes to be is revealed, and what it cas well as what is concealed, and how this affects our perception of the work’s coloristic relationships both color and material relationships in the work. Stepping back it is easy to re-establish the initial, more pictorial reading, but it remains hard to get the secondary, materially- inflected one out of our head. This juxtaposition of material-oriented and composition-focused readings, which are presented in the paintings as both discrete and related, sets Obering apart. For example, from other artists who, in the same moment, turned towards the unstretched canvas: such as the French artists associated with Supports/Surfaces, like Claude Viallat and Daniel Dezeuze, as well as Americans like Alan Shields, whom Obering mentioned in her MFA thesis. These artists place greater emphasis on the architectural and physical resonances of the unstretched canvas than Obering, who primarily exploits its possibilities as a compositional element within a self-contained pictorial structure. 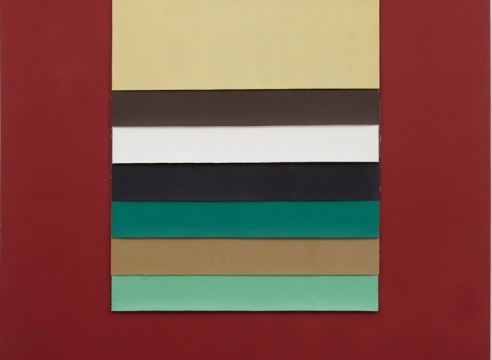 This basic format is repeated across a number of other works—including The Chinese Place, Balcony, Untitled, and the expansively horizontal Bunker, Lawn, and Scape—suggesting a sub-series within the “drop” paintings. The most physical of Obering’s works from this period are those, like Grey May, that feature diagonal lengths of canvas. The angling of this piece, which is always the lowermost, and thus—as in the other paintings—the largest, but also the most concealed, registers an emphatic presence. However, as with all of Obering’s works incorporating unstretched canvas, it has a pictorial role to play as well. As Roberta Smith noted in her review of Obering’s 1973 exhibition at Artist’s Space: the “physical construction is countered by a perspectival illusion which the placement of the [loose canvas] pieces creates.” This is because these can be read as a plane that has been tilted into perspectival recession, suggesting that it is receding into the kind of illusionary pictorial space that many of Obering’s other paintings from this period largely deny by keeping everything on the surface. This exploration is restricted to a sub-series of works such as Inclination, Firefall, Caddo Day, Fleshscape, and Black March, which was included in the 1975 Whitney Biennial. 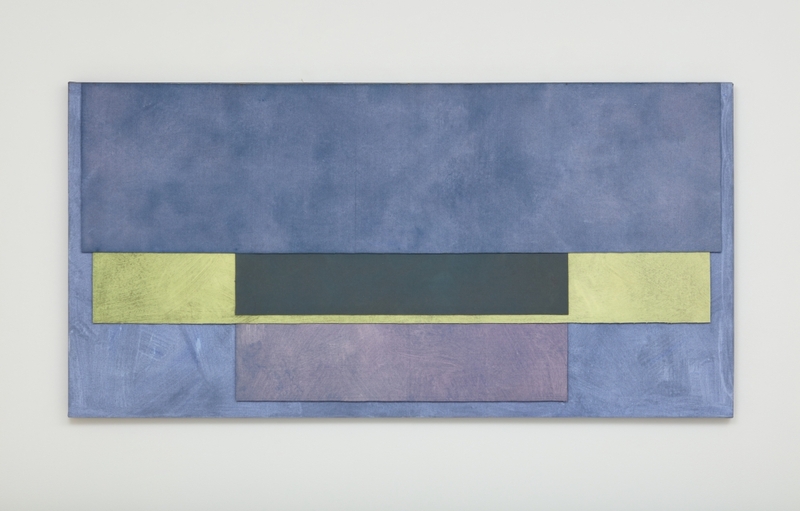 In Obering’s previous series, the so-called “window” paintings, which disperse both rectangular and angled pieces of canvas across the painting surface. In these works each unit retains more of its autonomy vis-a-vis the others, such that it even more emphatically suggests a certain kind of space, specifically that of the window, a favored model of pictorial illusionism since at least Dürer and Alberti. In the late 1970s Obering felt she had exhausted her, by then signature, mode of composing by layering pieces of pigmented canvas. She had long drawn on her passion for, and experience of, Italian Renaissance painting, primarily in her compositional strategies and sometimes through her color palette. Now she found herself drawn to two traditional techniques associated with that period: gilding with gold leaf and the medium of egg tempura, as well as the use of wood panels as supports. None of these methods or materials were much in vogue at the time Obering recuperated them, but among those who recognized her innovations was the seminal dealer Julian Pretto, who exhibited this work at his influential gallery in the 1980s and ’90s. It also attracted the attention of critics like Holland Cotter, who noted how these works amounted to a hybrid of painting and sculpture. In these paintings Obering juxtaposes passages of gilding with vibrantly pigmented ones of tempera, much as in medieval icons and Renaissance devotional panels. Yet Obering, as throughout her career, chose resolutely abstract compositions, instead of the figuration and narrative that anchored earlier uses of these techniques. Indeed, in some early works in this mode, comprising a series of so-called “slip” paintings, Obering broke down these techniques into their component layers: of plaster ground, egg tempura, clay, and the leaf itself, each of which occupies a banded section of the panel. This self-reflexive laying bare of materials and process is—again—very much in keeping in with the matter-of-fact approach of peers like Andre and Judd. Her compositions in these works vary, though some—like Hanging Pieces and Slip—have an stacked arrangement reminiscent of earlier works involving literal overlapping. Others, however, diverge, exploring motifs as varied as concentric squares (Blue Border), stripes (Untitled III), and abutted fields (Tialoc). Gold leaf has made only scant appearances in contemporary art. For example, in Yves Klein’s monogolds and Robert Rauschenberg’s gold paintings the approach, especially in Rauschenberg’s case, was to present the leaf as a singular, monochrome mass or aggregate of material. Whereas for James Lee Byars gilding had an incantatory role thanks to its art historical use as a mystical material evokingconjuring a spiritual beyond, something also evoked in Yves Klein’s monogold works. For her part, Obering, for her part, returns gold leaf to a compositional role that respects both the history of the technique and the formal goals of contemporary abstraction. By doing so she arrives at an innovation of her own making.